Ø The Machine is robustly and sturdily constructed and is capable of carrying jobs Like boring, turning, face turning, graving and tape turning. Ø All castings are of G-20 grade with 180 x 10 H.B. Hardness. Ø All gears are of EN-36 material and properly heat treated. Keeping in mind the ever-evolving requirements of our clients, we are offering an exclusive range of Vertical Turning Lathe Machine. Owing to our rich industrial experience and vast knowledge of this domain, we have been able to offer our patrons with the best quality of VTL Machine. 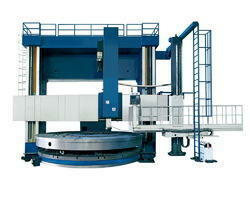 For efficient cutting, grooving, and boring of different heavy-duty materials, the offered machines are used. Such series of products adopt modularization design and the function can be selected arbitrarily. The product design is mature and reliable, thus, large amount of users have selected them.